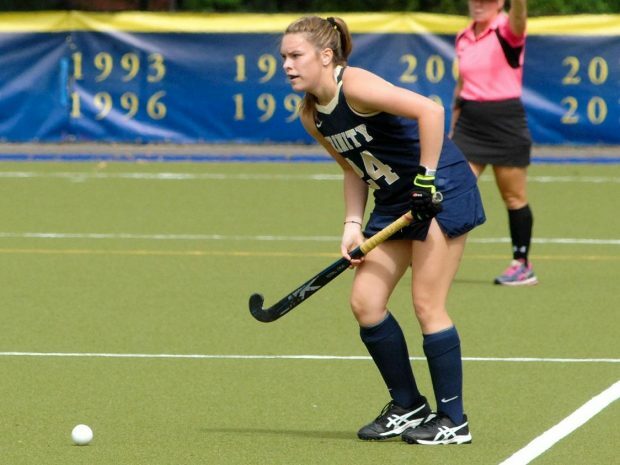 For the fifth game in a row, the Trinity women’s field hockey team beat their opponent in a complete shut-out. The Bantams, who are ranked no. 18 in the nation, improved their record to 6-2. Trinity routed the University of New England Nor’easters in a 5-0 victory last Saturday at Sheppard field. Bantam forward and senior co-captain Chandler Solimine (Pelham, NY) scored the first goal on a penalty corner only 11 minutes into the game. Trinity sophomore forward Kendall Brown (Greenwich, CT) scored the second goal on a rebound with 24 minutes on the clock. Clearly, the Bantams successfully held off the Nor’easters for all of the first half. The mid-game rest would prove to help the Bantams. In the second half, Trinity junior Nicole Quinlan (Duxbury, MA) was assisted by Solimine and scored on a give and go pass opportunity. As the second half went on, the Bantams recorded some impressive numbers, taking 19 shots and earning eight penalty corners. Some second-half highlights include senior co-captain defender Aly Slowe (Medfield, MA) and sophomore Caroline Fisher (Kennett Park, PA, who both scored goals just 1:08 apart late in the game. Trinity finished with a 29-to-5 shooting advantage and a 12-to-2 edge on penalty corners while improving to 4-0 all-time against the University of New England. Senior goalie Lori Berger (Scottsdale, AZ) needed to make just one save behind Slowe, sophomore Ellie Tate (Carlisle, PA) and rookies Elizabeth Provost (Sudbury, MA) and Christine Taylor (Westport, CT), who ran a clinic on the Trinity defensive side. As the Bantams record their fifth-consecutive shutout, they hope to continue to improve their impressive record and rise up the national rankings. As of after last Saturday’s match-up, Senior goalie Lori Berger (Scottsdale, AZ) has not allowed a goal in her last 378 minutes in the cage–a dominating feat for the senior. Solimine paced the Bantam offense with a goal and two assists, while Fisher and Quinlan both finished with one goal and one assist. The next match-ups for the Bantams include this Wednesday against Wesleyan, and Saturday against Bowdoin–both strong NESCAC rivals. The next opportunity for a home-field advantage comes on Tuesday, October 9th against Springfield College. Be sure to show support for your field hockey Bants!